Live Streaming Concerts. For Group or Individual Settings. Many in the aging services professions are aware of the power of music in healing and particularly with dementia patients. Many patients can remember and sing songs even in advanced stages, long after they’ve stopped recognizing names and faces. Dementia care homes often use music as recreation, since it brings patients pleasure. There’s growing evidence that listening to music can also help stimulate seemingly lost memories and even help maintain some cognitive functioning. That is exactly why Glen Campbell came to life when he took the stage during his farewell tour, after being diagnosed with Alzheimer’s! In an Alzheimer’s Association newsletter, John Carpenter, founder of the world-renowned Rebecca Center for Music Therapy in New York, shared that music helps stimulate communication and memory skills. Listening to live music and being involved in live music-making experiences empowers people to emerge from the isolation imposed by dementia or simply from loneliness. People who are connected this way are less depressed, more likely to engage in other meaningful activities, and less likely to be given anti-psychotic medications for their symptoms. Another study has shown that the mental acuity of Alzheimer’s patients who regularly sang over a four month period rose sharply. And still another study revealed that nursing home residents with dementia who often get agitated can benefit from internet video chat that enables residents to both see as well as hear others while reducing agitation. A study of adults with early memory loss found that practice of meditation or music listening showed significant improvements in memory & cognitive function. And yet another study showed that personalized music therapy may help decrease antipsychotic use and improve dementia symptoms in individuals with dementia. Need more evidence? Look here. Imagine designing a completely customized live music program that is delivered to your residents in a group setting or staged for an individual. Request songs. Add a relaxed conversation where we can call attention to a birthday, a milestone, or anything that would engage your residents. I fell into a mission for elders when I started performing in nursing homes some 20+ years ago. A professionally-trained singer, I have literally performed thousands of concerts in senior living. I know how to connect with older adults. I am extending my reach by streaming live concerts over the Internet that can be viewed on smart TVs, computers, and mobile devices. These concerts can be for groups or customized for individuals. to the live concert or separately that make great gifts. Our group concerts are held frequently on Skype. Check out our schedule and register. If you want a one on one concert, purchase it here and in the order notes please include a variety of dates and times that you would prefer to have me sing for your loved on, client or resident. 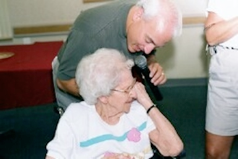 Having given thousands of live performances in senior centers, skilled nursing, assisted living and independent living, I have a huge repertoire of songs to choose from and know how to engage seniors. Listen to me here. See me here. A staff member does not necessarily need to be the person viewing the concert with a client. Work with local schools and have students adopt home-bound elders. They can visit for an hour, watch the concert, and then talk about it. One of the best ways to spread positive word of mouth and generate referrals is to give something away. These concerts are an ideal venue for just that. You will be providing clients and their families an invaluable, thoughtful and customized experience that they will tell others about. And what a great gift for a parent or grandparent, one in which you can participate in directly. Want to speak with me about this directly. Contact me. Group Concerts – See Our Schedule and Choose Your Date. One on one concerts. Three options. Concert only. Concert recorded on CD. Concert recorded on DVD. Include in your order some suggested dates and times for the concert, anything you want to tell me about the person and include the types of music and even specific songs that they would enjoy.